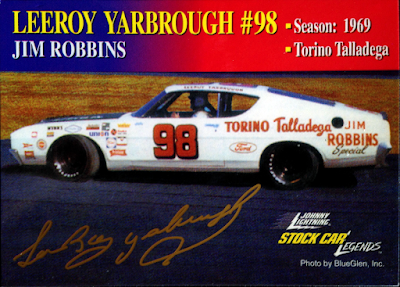 Two racing related posts out of my last three? Page views are going to tank, but I'm doing this anyway. Yesterday, my wife and I ended up at Target - which is an extremely common occurrence when I let her pick the evening's entertainment. The excuse was that we needed cat food and a birthday gift for our good friend's one-year old, but I know she truly just wanted to peruse the aisles of her favorite retail establishment. Something about that place just draws her in, like a big, red beacon - it calls her name, longingly, just like the local card shops do for me. We all have our weaknesses, right? I'm not going to lie, I kind of enjoy meandering through the store, every now and then, as well. Of course, I always make a stop in the card aisle, just to check in. This time, I was hoping to find some archives, but this Target is so slow in stocking those displays that those packs won't hit the shelves until next week. With the rest of the selection otherwise uninspiring, I moved on from the cards and ventured through the rest of the retail wonderland. 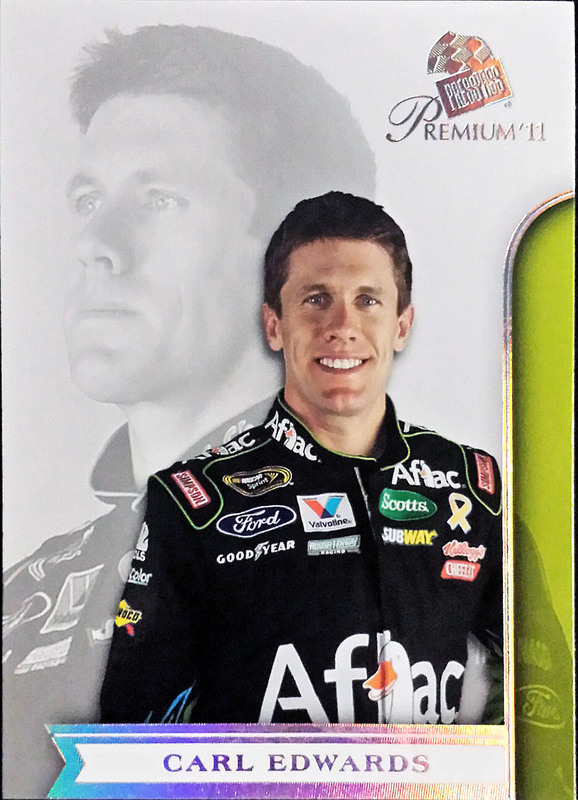 Full disclosure, I pretty much bought this exclusively for the "free card" packaged with this scale model. 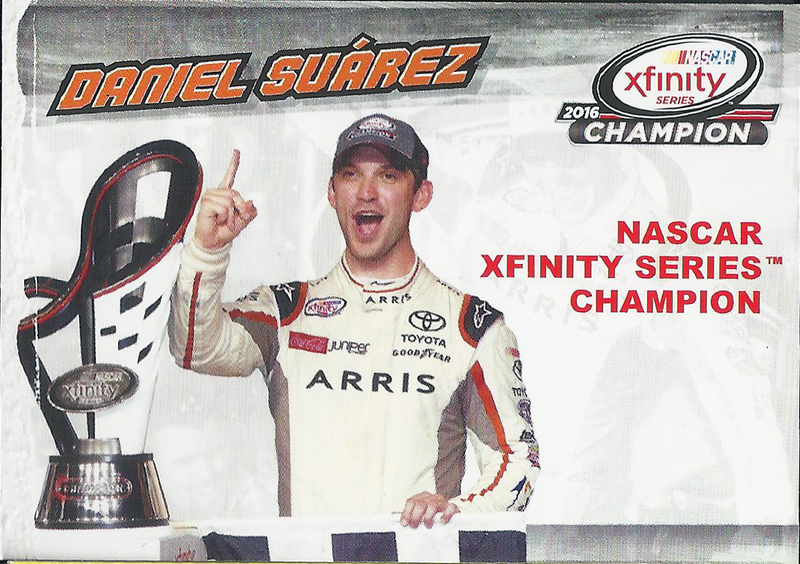 Daniel Suarez has been rising up the NASCAR chain since 2010, when he won the Rookie of the Year award in the Mexico-based Corona Series. In that time, Daniel has given sport hopes of having found their first Latino star, signing on with the powerhouse that is Joe Gibbs Racing. 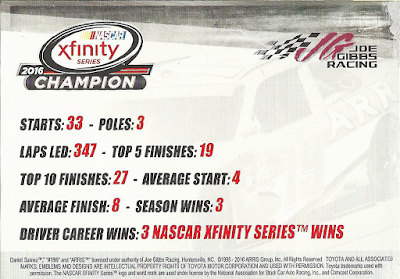 Last season, in the Xfinity Series (the AAA equivalent), the Monterrey, Mexico native won three races, on the way to the series championship in only his second full campaign. In honor of that achievement, Lionel Racing released this special die-cast, emblazoning this career highlight on the roof, as part of it's retail NASCAR Authentics brand. When Joe Gibbs superstar, Carl Edwards, shocked the racing community by announcing his premature retirement from the sport (at the age of 37), this past January, the seat of the #19 Arris Toyota Camry suddenly became vacant. With that, Suarez's developmental timeline suddenly shifted into high gear and the prospect ascended to the ultimate level of NASCAR - the Cup Series. Since the start of the 2017 season, Daniel has competed in all 12 races completed thus far, has thrice finished in the top 10, and sits 19th in the point standings - not bad for having been thrown into the fire with precious little warning. 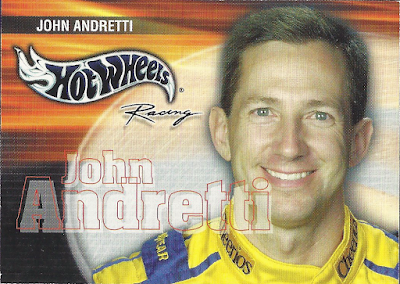 While I no longer actively collect die-cast, my racing card collection was rebooted a couple of years ago. 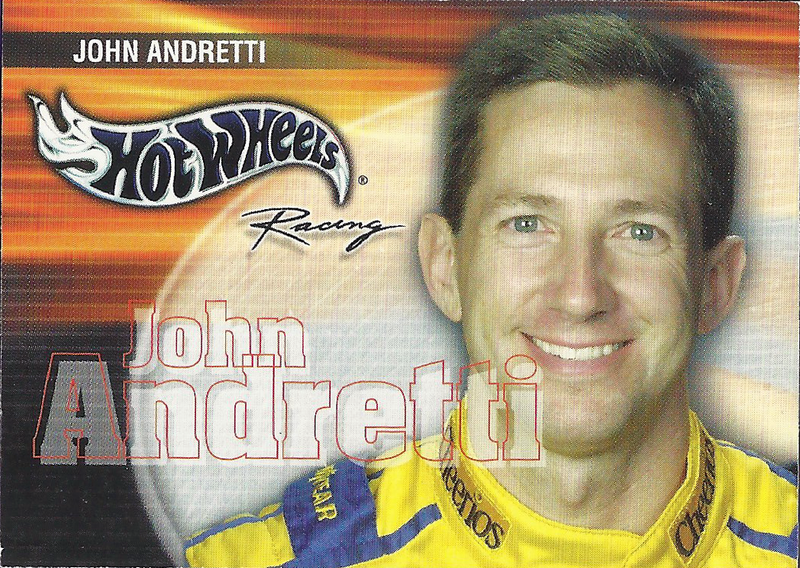 Since Daniel has now made his debut and become a regular in the Cup series, he must now be officially added to my All-Time NASCAR driver collection. 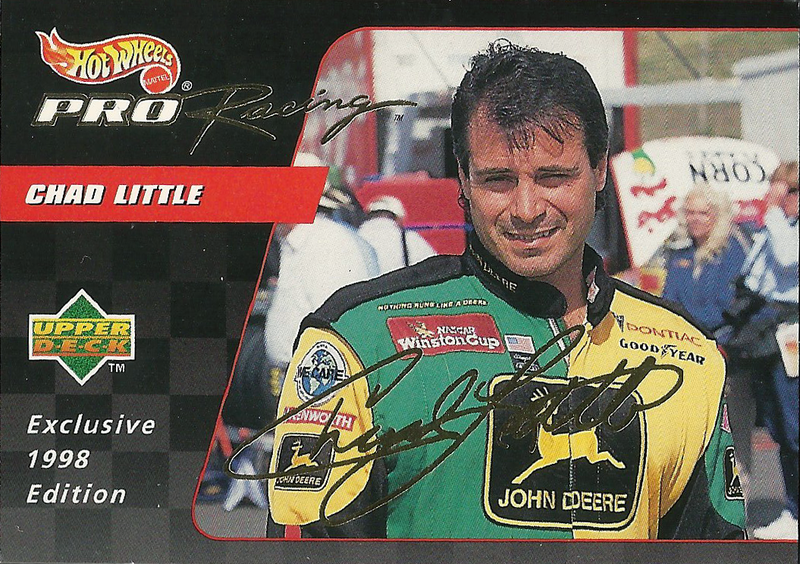 Much like I collect one card of any Cub, Bear, Bull, or Blackhawk, I also accumulate one card of every Cup driver. These days, when it comes to motorsports, most of my focus is on the Indy 500; that said, I do maintain a passing interest in stock car racing and NASCAR actually has trading cards. 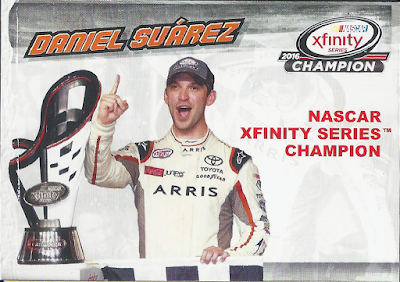 Therefore, I grabbed the car off of the hanger, hurried back out of my erstwhile paradise, rendezvoused with my wife, and plunked down the five bucks exclusively so I could have a Daniel Suarez card to add to my NASCAR binder. Silly? Maybe - but, I don't care. Unfortunately, once I opened the blister packaging, I was frustrated to discover that the trading card was sealed in between the plastic and the cardboard backing. With the cardstock already being extremely thin (it feels almost like laminated computer paper), the object of my attention tore slightly and suffered some significant paper loss on the left edge, as you can see in the scan above. I guess that's what happens with the card is supplementary to the main event. Harumph. That's just how the cookie crumbles sometimes - I will still gladly keep it in my binder. 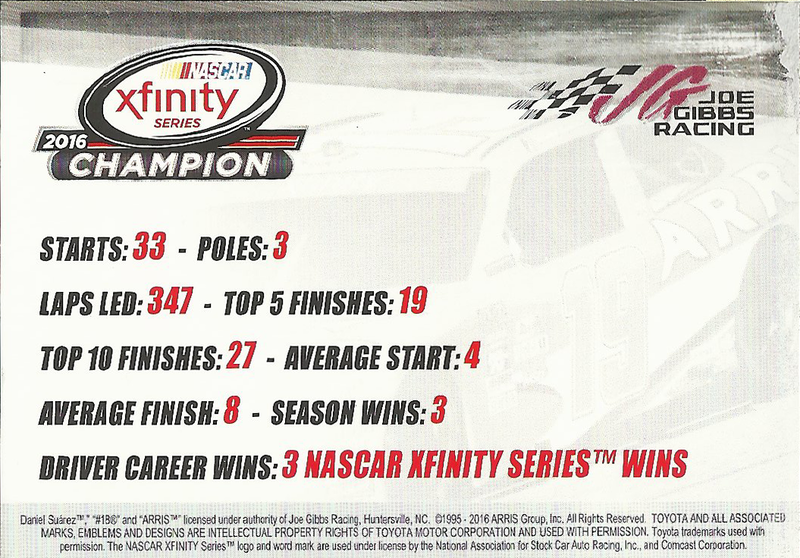 The back of the now-damaged card reads off the statistics for Daniel's championship season in 2016, which, as should be expected, were pretty darn good; plus, the championship mark and the JGR logo make an appearance. It's a very simple piece and it won't be rivaling Panini's pack-based products, but it makes for a fine oddball in the wasteland of exclusive licenses. All in all, I was quite happy to make this addition to my collection and relive a significant part of my childhood along the way. In fact, without the trading cards that came along with the NASCAR diecasts that I blew so much of my allowance on, I don't know that this blog would even exist. 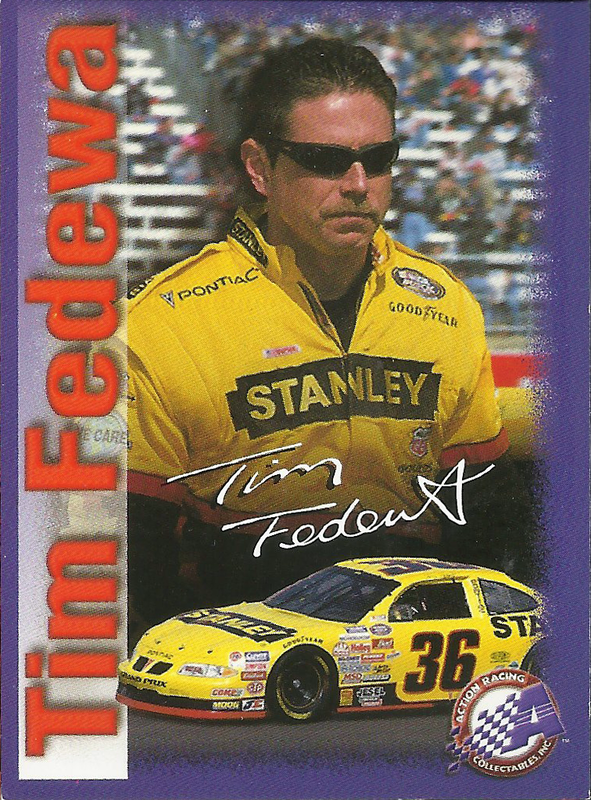 You see, when I first stepped away from collecting baseball cards in the late 90's (when my grandfather, who instilled my love of baseball, passed away), I soon dove headfirst into NASCAR. When the money I earned from taking the garbage out and folding the laundry went to purchasing Hot Wheels and Racing Champions branded NASCAR products, my baseball cards were tucked away in the back of my closet, to be forgotten for several years. 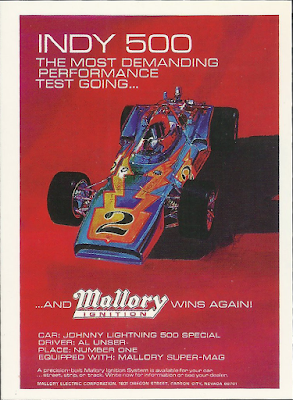 ...and Johnny Lightning, among several other brands. 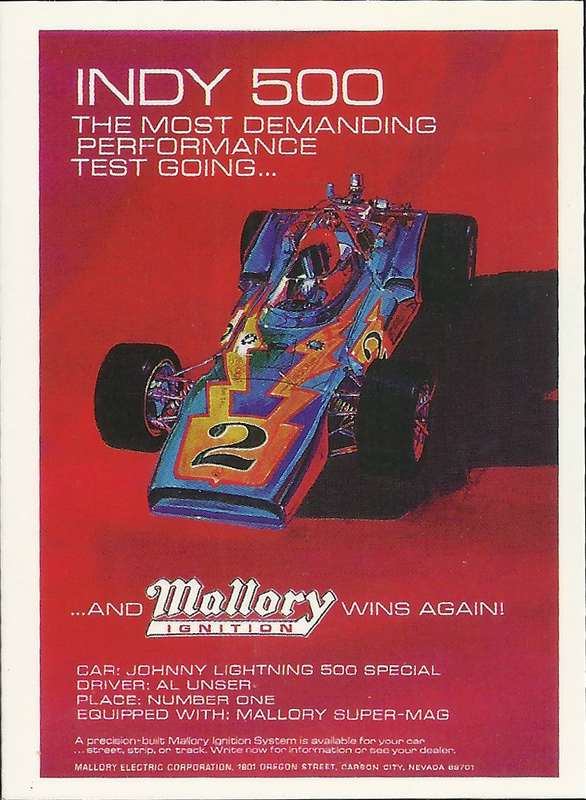 Sidebar - while Al Unser's "Johnny Lighting Special" was quite obviously not a stock car, I felt compelled to include this card here as I think it's the coolest race car ever to hit the track. 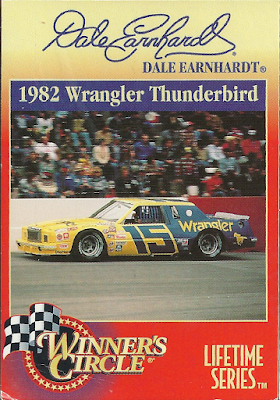 Much like the trading card market of the 1990's, NASCAR branded die-casts were being produced by a multitude of companies. 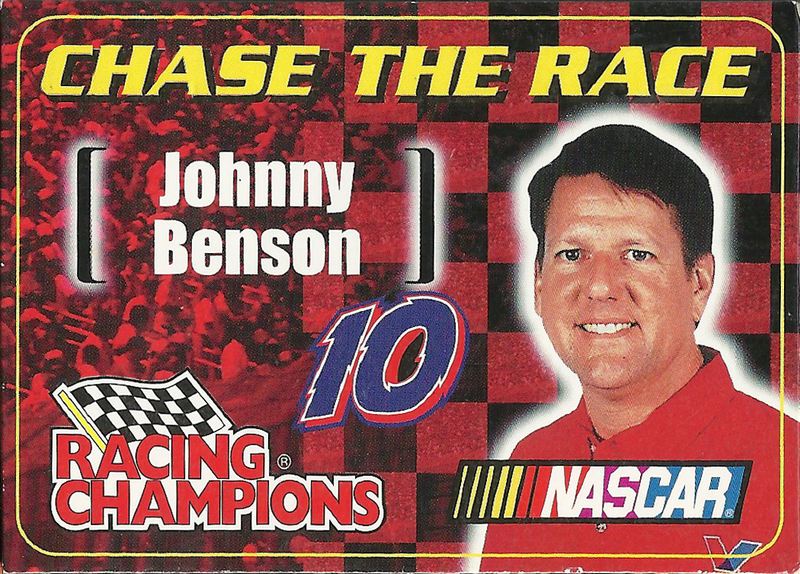 I'm not exactly sure of how this market looks today (Billy Kingsley of Cardboard History would be the go-to source here); however, to my untrained eye, it looks as though Lionel Racing has exclusive reign these days. Cue the sad trombone - exclusive licensing strikes again. 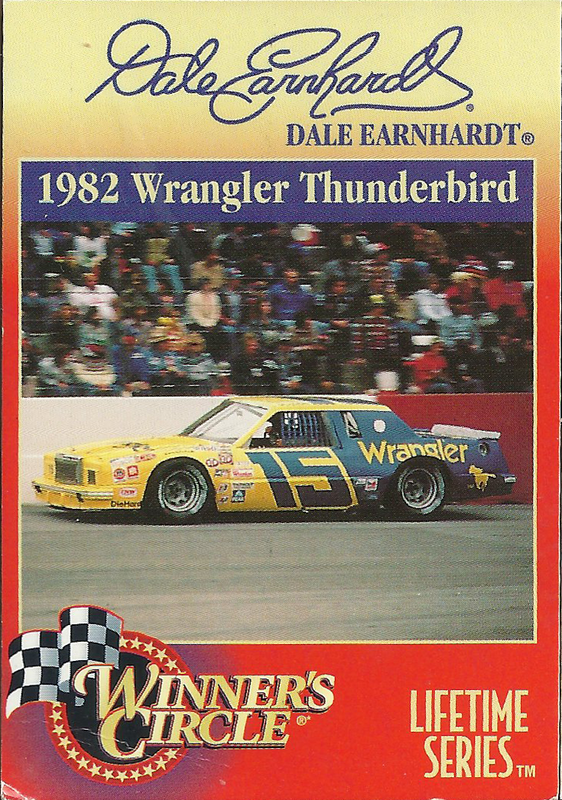 Anyway, as these "free cards" piled up, I soon took to buying packs of NASCAR trading cards as a means of supplementing this side collection. Then, when the 2003 Chicago Cubs reinvigorated my passion for our nation's pastime, I shifted from buying packs of Press Pass to packs of 2003 Donruss Team Heroes instead. 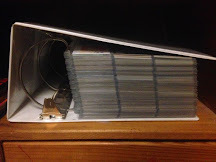 Shortly thereafter, my old baseball cards came out of the closest and the rest, as they say, is history. Funny how everything ties together, isn't it? What a tangled web we weave. Anyway, that's the long-winded tale of how without cards like Daniel Suarez, my card-collecting urges might have been totally quashed, Wrigley Roster Jenga would have never existed and I might have had a ton more free time on my hands. On the latter point, as my wife will surely tell you, that probably wouldn't have been a good thing. I do silly and stupid things when I'm bored. Most importantly, I wouln't be involved with this wonderful blogosphere/cardsphere community! 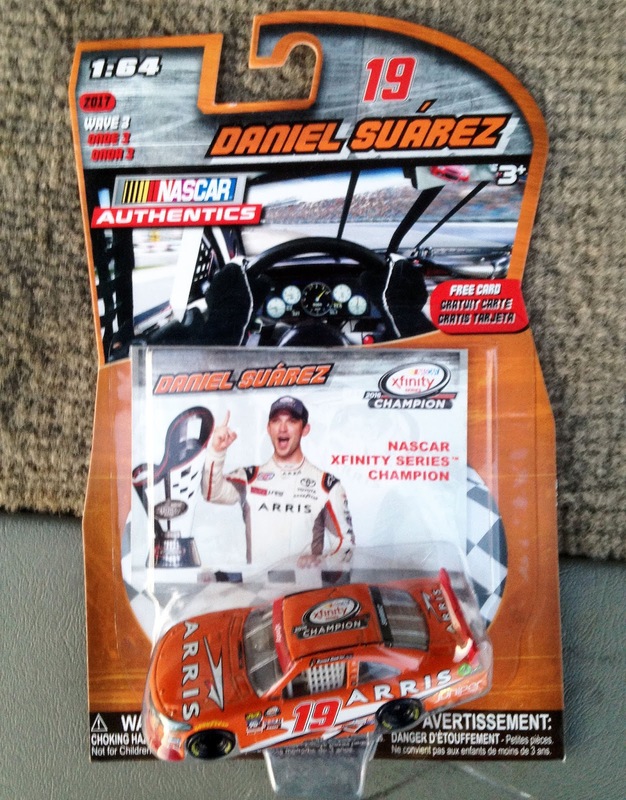 As it stands, Daniel Suarez is properly represented in my All-Time NASCAR binder and, along with a healthy selection of children's books, our friend's kid now has himself a nice little gift. Both he and his older brother are absolutely fascinated by anything with wheels - cars, trucks, trains, motorcycles, etc. - I figured that he might enjoy adding this race car to his toy collection. Well, he might have to wait a few years - small parts and choking hazards and such - but, it shall be his. It should pair nicely with the children's books we bought for the tyke during the same Target run, which were "wheels" themed. Oh, by the way, the cats got their food too, in case you were worried. 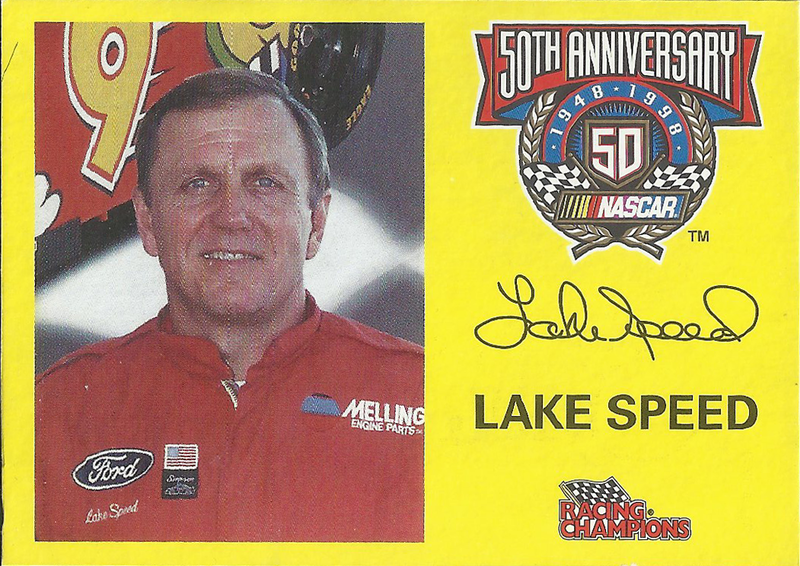 Holy cow...LAKE SPEED!!! I hadn't thought of him a a loong time! Always pulled for him, Dave Marcis and Harry Gant. I was seriously into NASCAR in the 80s and 90s and I kind of wish I could get into it today but that's not likely to happen. 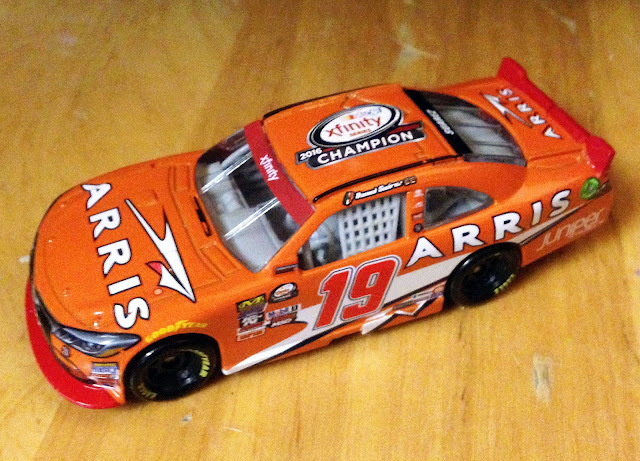 If it did I'd be a Daniel Suarez guy though. I still have a few cars on the shelves though. The rest I gave away to my kids at school. Yes, Action/Lionel has the exclusive license and has for nearly a decade now. They only started issuing cards again recently. Can you tell me the card number on the Chad Little card? I'm trying to build the checklist and don't have that one. Stinks that the card was sealed into the plastic. The machines that do the work are not always good. My first card of Daniel was an autographed relic card, which I got as a Christmas present. 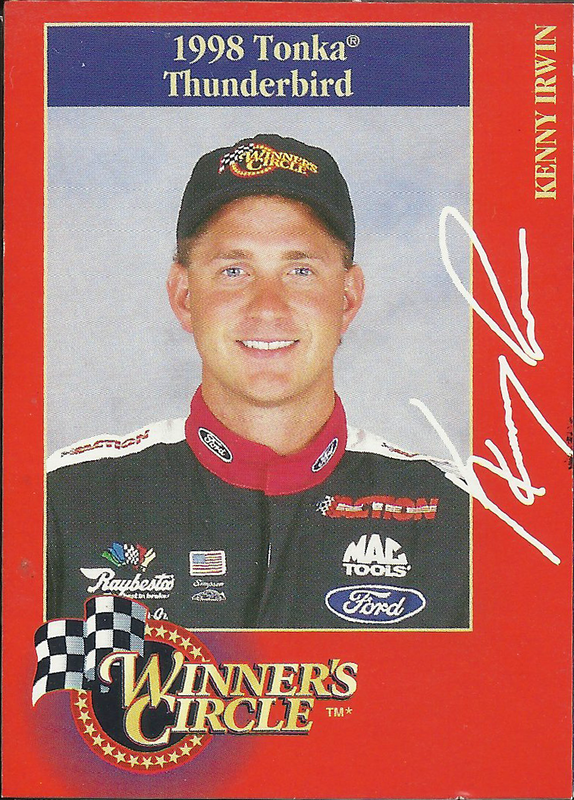 Kenny Irwin...I was really becoming a fan before the wreck. I just wish he'd gone the other direction and further up the open-wheel ladder. An Indy boy winning the 500 will likely never happen again. He could have done it. 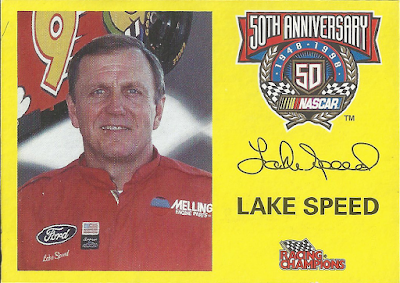 At least you were able to get two guys in the post that ran the 500. Little victories.